Low cost current transformer secondary burden 1, 0.5, 0.5S, 0.2 or 0.2s or 1 , rated ratio 600:5A, 800:5A, 2000:5A or 3000:5A. Current transformer is one of important devices for power system and used to transform the voltage or current. Wire connection of current transformer shall follow a series principle: namely the primary winding should be connected in series with the circuit under test, while the secondary winding should be connected in series with all instruments and loads. Choose the right change according to the magnitude of measured current, otherwise the error will increase. Meanwhile, one end of the secondary side must be grounded, so as to avoid personnel and equipment accidents caused by high voltage at the primary side when the insulation is damaged. 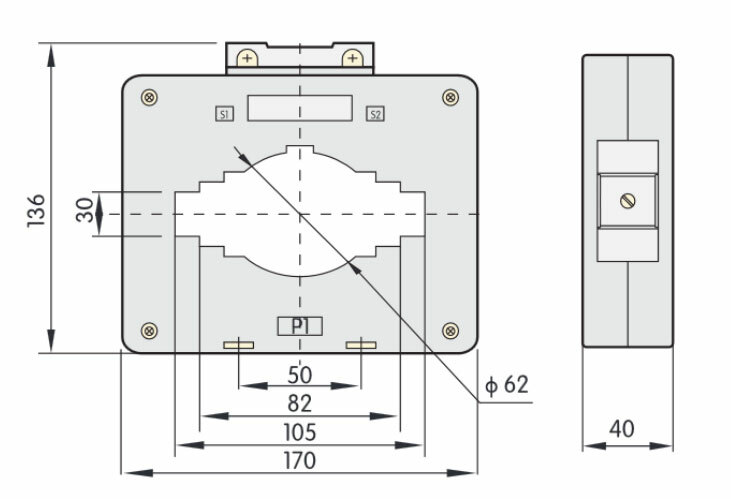 The secondary side is not allowed for open circuit. Once it's open circuited, current I1 at the primary side would fully turn to magnetizing current, φm and E2 would increase sharply. As a result, the iron core would occur supersaturation magnetization, heat seriously and even burn out coils. Meanwhile, supersaturation magnetization of the magnetic circuit would increase errors. Under normal operation, secondary side of the current transformer is nearly short circuited, if it's broken suddenly, the excitation electromotive force increases sharply, the magnetic flow in the iron core shows seriously saturated flat waves. As a result, the secondary side winding would induce high spike waves when the magnetic flow passes through zero, it can be thousands or even tens of thousands of volts, thus endangering the personnel safety and insulation performance of instruments.